Teammates Representing Body Concepts: Jack Wenzel, Matt Conidaris, Randy Floyd, Ron Faulk, Will Parks. Field: Total of 24 registered riders. Solid field. Good climbers present. Weather: 55 to start going to the low 60’s. Wind was moderate to start, 10 mph?, forecasted to go to 19. It did at least that by the fourth lap with gusts probably being higher. Strategy: Work with Bikes Plus to put three of our riders (Mike, Randy F. and I) and four of their riders in a break following the first lap. Others from both teams were to stay near the front and block. If that failed, Randy V. was the designated rider and we would form a lead-out train to deliver him to the line with me doing the final the lead out. Race: Field of 60 registered with ourselves, Fun Sport Bikes, Folsom Bike, Kovarus/Wells Fargo and Bicycles Plus/Sierra Nevada having at lest 4 riders registered. We were represented by Ron, Randy F., Randy V., Matt, Mike, Will, Jim, John E. and myself. Weather: Low 60’s at the start, low 80’s at the finish. Course Description: 3 laps around a flat 18 mile course with one hill and a few rollers. but not too bad (7-10 mph). Usual course, 60 miles, 2,893′ of climbing. Same lousy road surface from mile 10 to mile 34. In addition to the main climb (1,100′ in 2.8 miles), there are 2 other significant climbs the 2nd of which is the feed zone climb @ mile 42. The finish line is not very distinct. There are several turns and then a final left hand sweeper that is about 2k before the finish line. The 1k & 200m points were marked with a sign. The finish is wide open and flat and there’s not usually much of a field left so setting up for the sprint is not such a big deal. Race Plan / Strategy Get to the front before crossing Hwy 20 and maintain position in the top 10 riders to the climb. 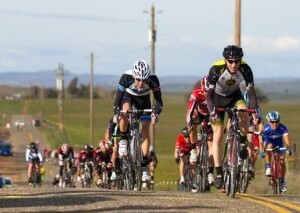 I was hoping to be able to hang with the lead group up the climb. 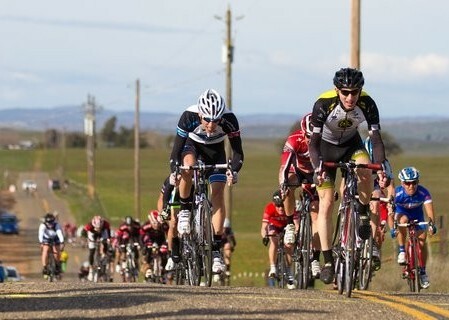 Any teammates that were close together after the main climb were to group up and work together to the finish.